millennia. 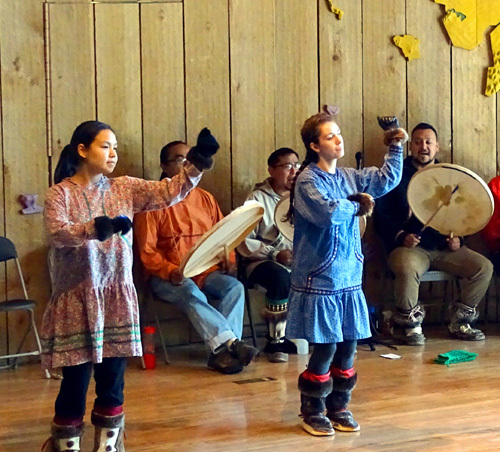 Anchorage is home to members of each Alaska Native cultural group. 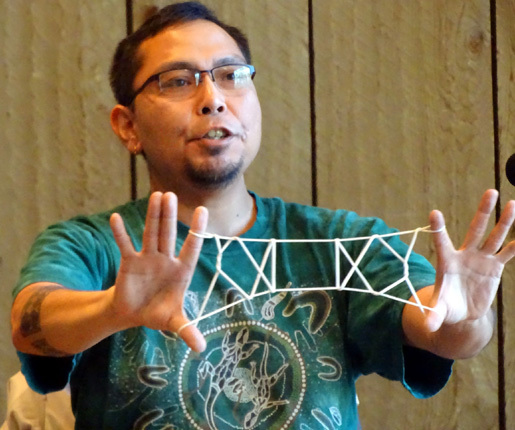 Native traditions, dances, and stories are passed down through generations. This rich heritage is woven into the tapestry of the city as a whole." 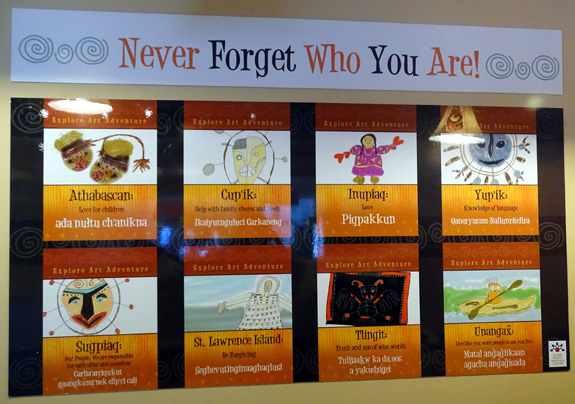 One of the most interesting things I did when we visited Alaska three years ago was to learn as much as I could about the six traditional Alaska Native cultures at the Anchorage Museum, Eklutna Historical Park, Wrangell-St. Elias NP visitor center, and other venues around the state. 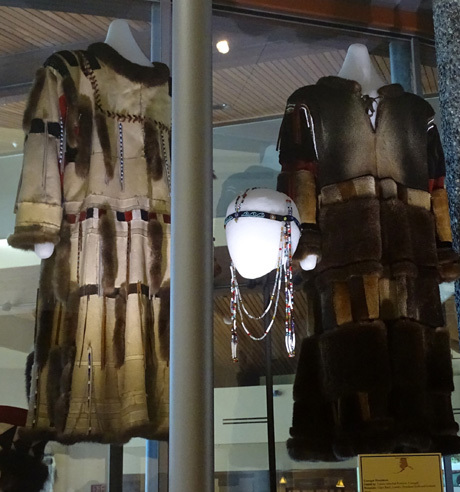 This was the first time I visited the Alaska Native Heritage Center, however. 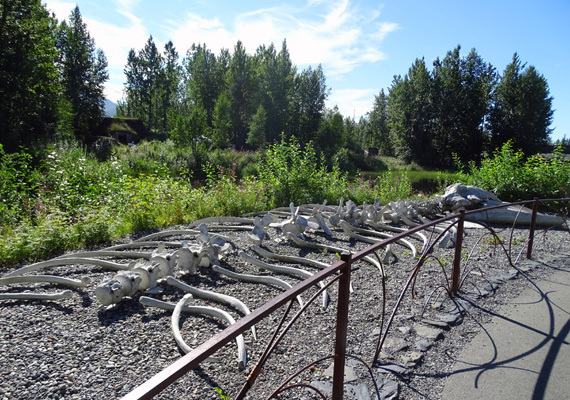 This large complex (26 acres) is located just outside JBER's Muldoon Gate, so I took the opportunity to explore it today. Since our return to Anchorage on Saturday we've been busy with restocking groceries and supplies, running other errands, doing maintenance work on the truck and Cameo, walking and cycling with the dogs on base, journaling and editing photos, doing some trip planning, visiting with campground neighbors, and just relaxing. 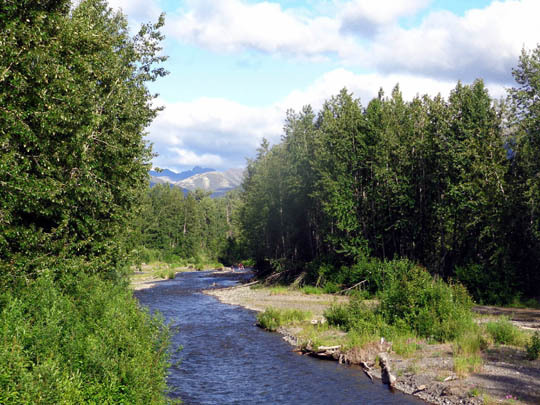 Fish Creek, from the bike path at JBER; this is a good place to see moose, bears, and salmon. It was fun for a few days as he'd hear things he hasn't noticed for years, or he'd jokingly ask me if I could type at the computer more quietly! Maybe when his hearing gets even worse he'll try hearing aids again . . . Maybe. The weather has been nice enough most days this week for me to go out and do more hiking but I'm letting those nasty wounds on my arm heal a bit more. The forearm where the large flap of skin was torn loose and new skin has to grow is still oozing just a bit and needs a couple more days to dry out before I do a long hike. I have to keep it covered most of the time so it doesn't become infected. The other wounds are healing quickly, I'm not in any pain (only the first 24 hours), and I'm able to sleep OK. I've just added to the tapestry of scars on my body from years of clumsy trail running and hiking. 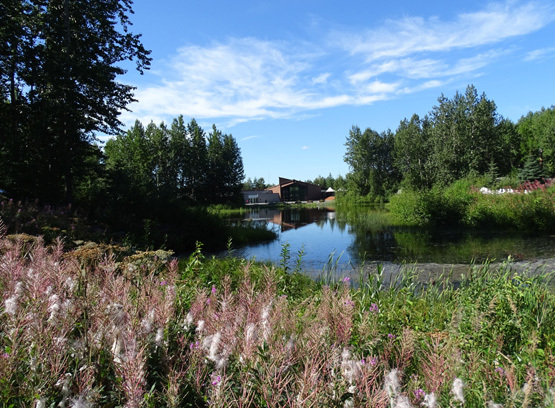 Twice today I heard that it is already autumn in Alaska. My goodness! A weather person said it on TV, after commenting on Anchorage having the second-highest number of days over 70 F. this summer since weather has been recorded (about 64 years), and a storyteller at the Alaska Native Heritage Center also mentioned it in reference to the cooler nights, leaves turning, berries ripening, and animals more frantically putting on weight for the winter. 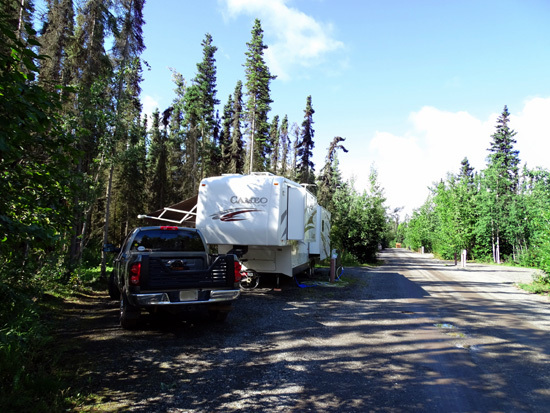 There are also more vacancies in our campground than I would have expected this time of year because visitors from the Lower 48 are already heading home. 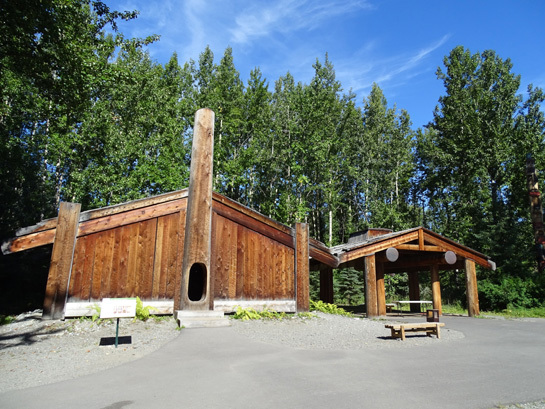 Temps were definitely lower last night -- 43 F. on our thermometer -- but it felt quite warm in the sunshine during the day at about 70 F. This is within Jim's and my ideal temperature range and it was a gorgeous day to explore the outside villages and exhibits at the Alaska Native Heritage Center. Jim needed parts for the truck (sway bar links) and time at the library to upload/update some things on our computers. 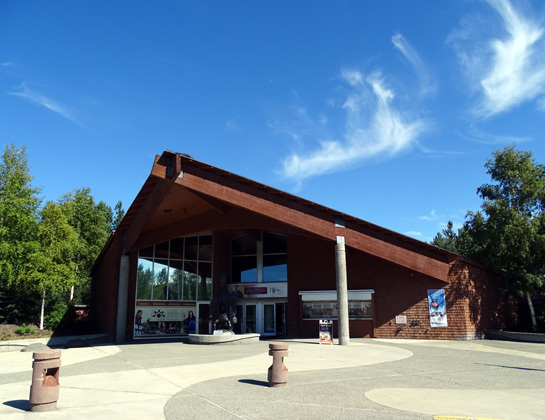 He dropped me off at the Heritage Center and I spent 2� hours soaking up Alaskan culture. 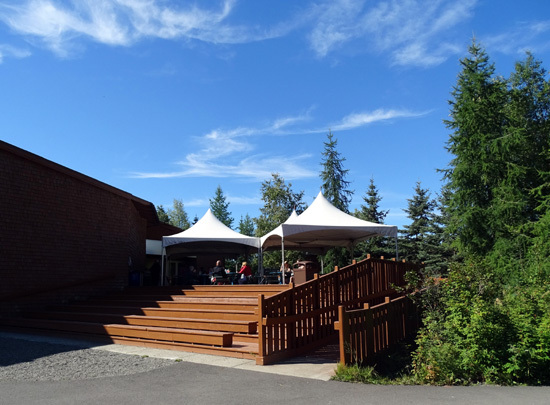 You can easily spend even more time at this excellent facility with all the available exhibits, demonstrations, and programs that are conducted throughout the day. Cost for seniors and military is $21.15 for all day. 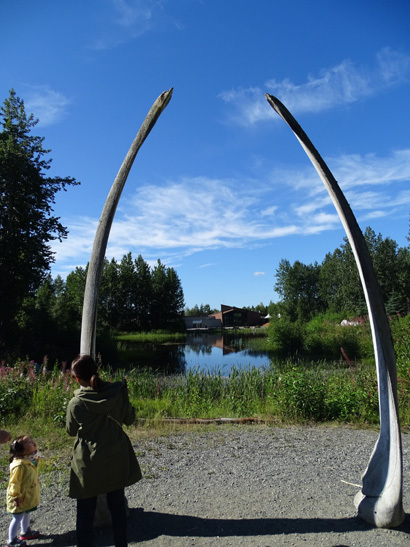 You can also purchase a reduced-price pass that includes both the Heritage Center and the Anchorage Museum. I highly recommend visiting both. 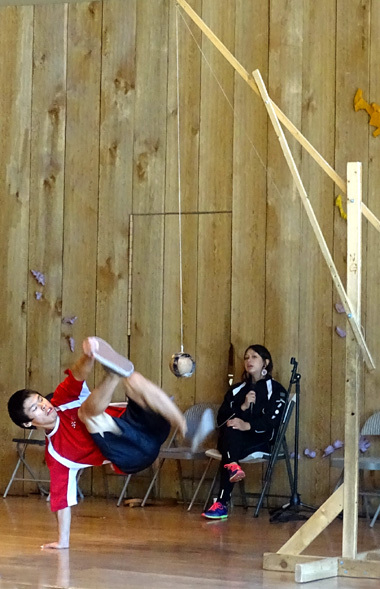 I feel like I got my money's worth today watching the dancers, listening to the dance interpretations, watching two young men doing authentic Native Games, watching a storyteller make string figures while he talked about his clan's culture, looking at the exhibits, watching art & craft demonstrations, and wandering around the outdoor villages representing the six different indigenous cultures. Dining al fresco on a beautiful day. I also had lunch there. I was hoping for some native dishes but those weren't offered. I got grilled chicken fettuccine and tasty rolls for $9. 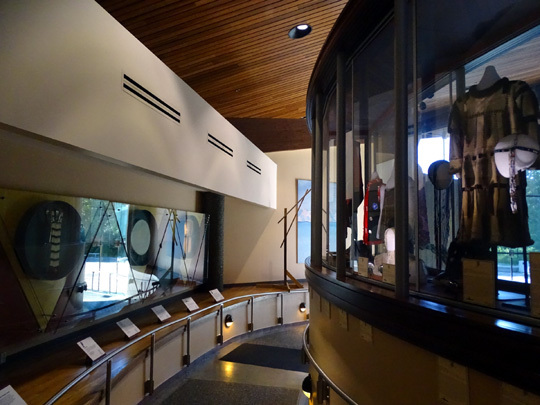 Many of the programs and exhibits take place indoors in the large building called the Welcome House. 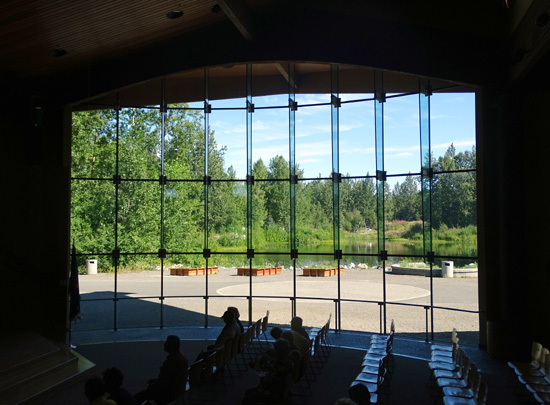 The window wall in the auditorium looks out on the lake and Native villages. I watched the four young women in the next photos do two different dances, once in the morning and again in the afternoon. 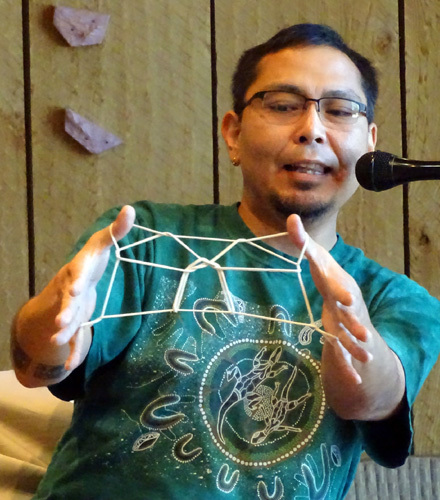 This fella was busy today; he also did the string storytelling in the afternoon. games; a young woman (in black) narrated. I didn't have time today to watch any of the movies but I'm sure they are worthwhile. 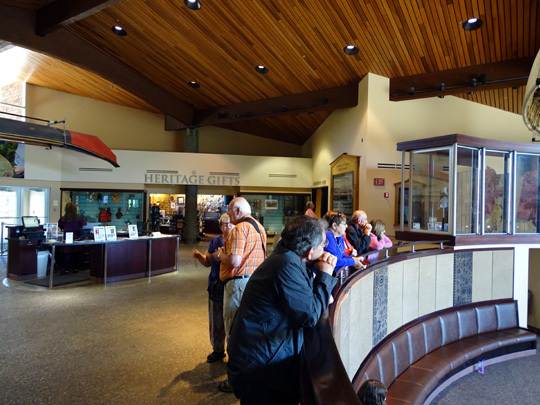 Although any purchases from the gift shop would cost $$, the theater presentations are included in the cost of entry to the ANHC. 1. Athabascans were traditionally highly migratory, traveling in small groups to hunt, fish, and trap. 2. Yup'ik and Cup'ik peoples' homeland lies along a large delta area west of what is now Anchorage. Numerous lakes and streams flow out to the Bering Sea. Much of the land is tundra. 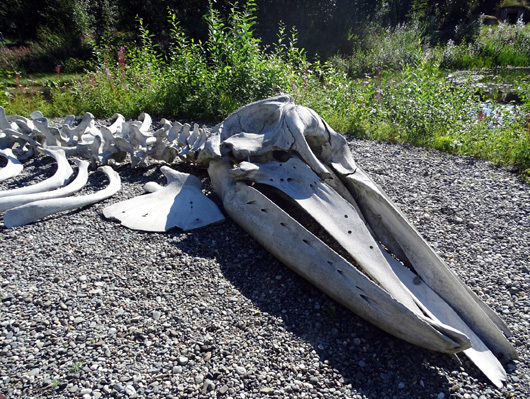 Along the coast the people relied on marine mammals, fish, berries, and plants for subsistence. Inland they hunted caribou and moose and fished for salmon and freshwater fish. 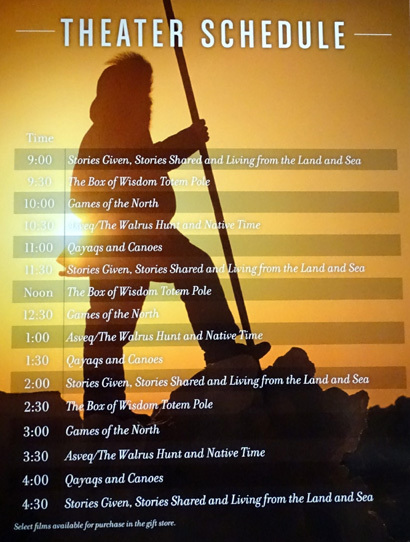 Like the other indigenous groups, their lives were dictated by seasonal cycles. 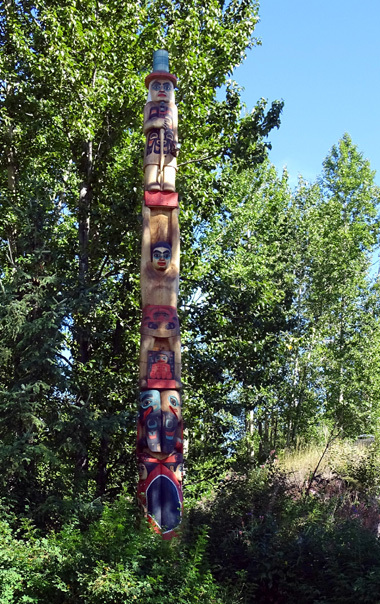 In this culture the women and children lived in separate wooden post and beam structures from the men and older boys. 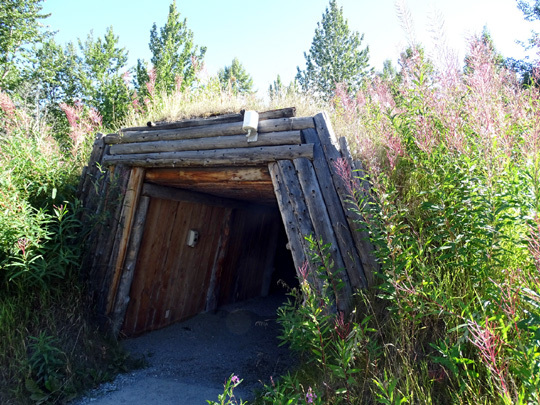 There was a subterranean winter entrance and a more open summer entrance to these dwellings. 3. Inupiaq and St. Lawrence Yup'ik territory is also quite large, occupying the far north and northwestern part of what is now the state of Alaska. 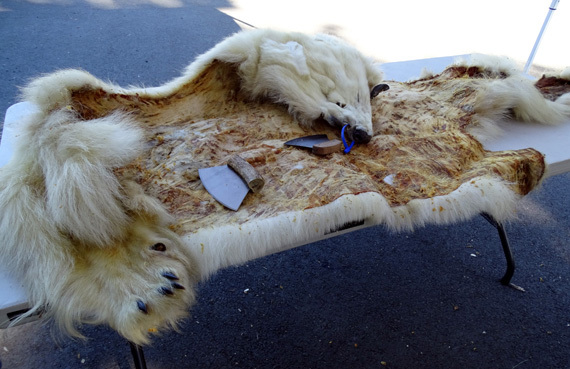 Like other Native peoples, they relied on subsistence hunting of sea (whales, walrus, seals, polar bears) and land animals (sheep, ducks, geese, caribou, moose, etc.) and gathering of other resources like fish and plants from the ocean, rivers, and mountains. One whale could feed an entire village. 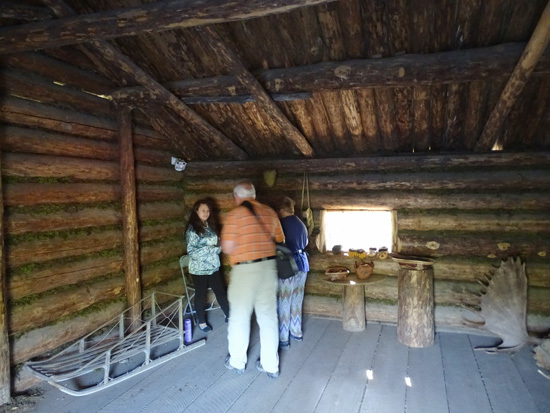 Winter villages had a large community house where clan members gathered for meals, singing, dancing, story-telling, ceremonies, etc. 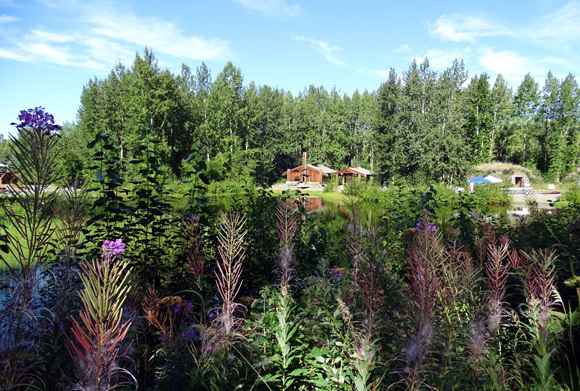 The people moved to skin tents in warmer weather where fish, plants, and berries were plentiful. 4. and 5. 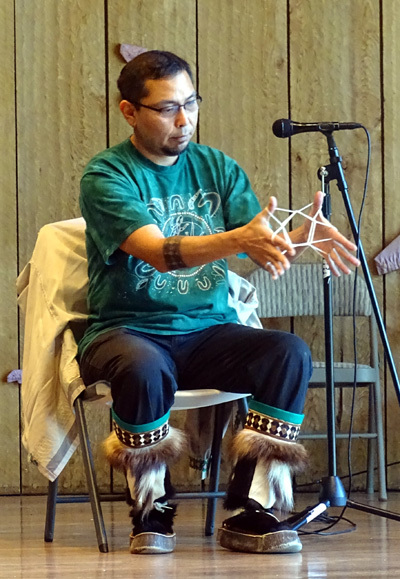 The Unangax and Alutiiq (Sugpiaq) are maritime people living from Prince William Sound to the long chain of Aleutians and Pribilof Islands southwest of mainland Alaska. Their cultures have been shaped by the sea for thousands of years. 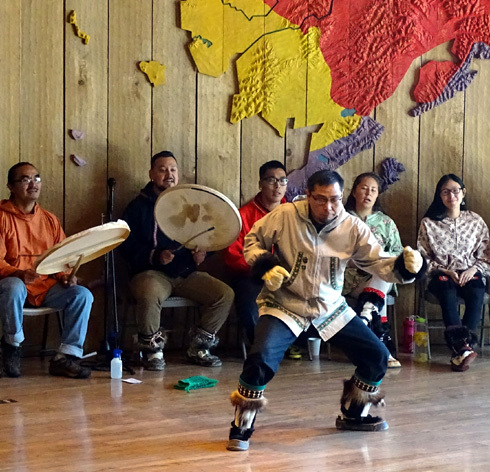 These seafaring people of the North Pacific Rim were expert whale hunters and fishermen. 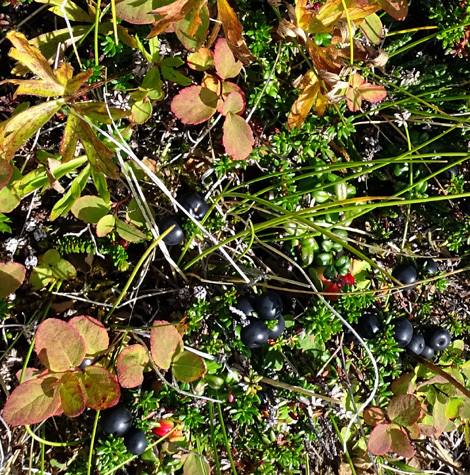 They also hunted birds and collected roots, berries, and plants. 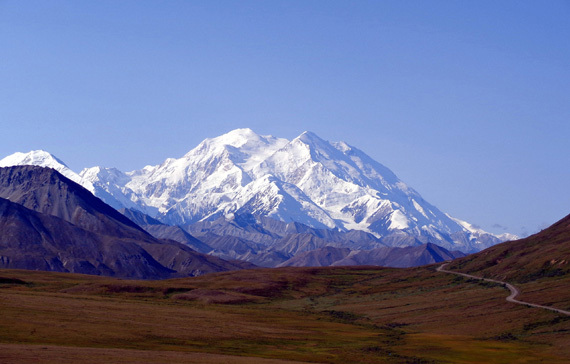 Caribou and mountain goats were important food sources in the eastern region off the southern coast of mainland Alaska. 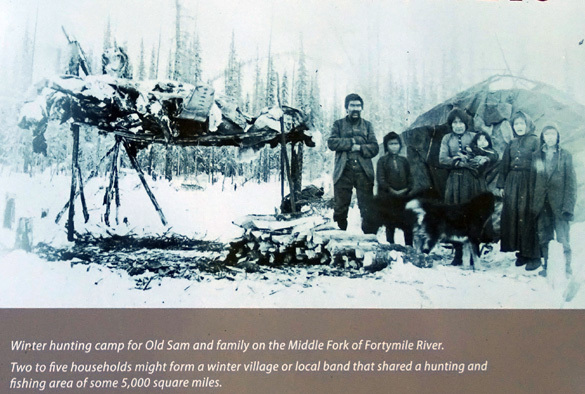 Like other Native Alaskan cultures, these people hunted whales and believed that all animals deserved respect and proper treatment in both life and death. 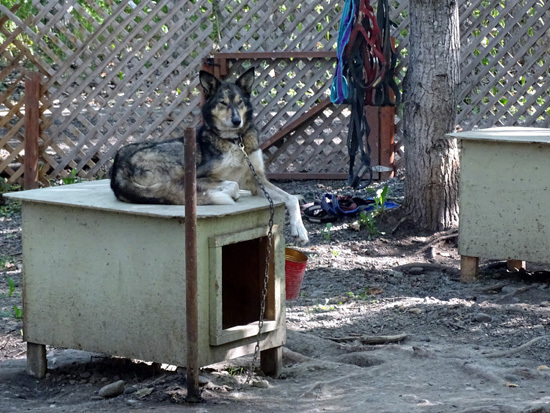 Many Alaska natives also believe that the spirit of an animal, taken in a respectful manner, will return to an area and sacrifice itself once again so that the people might survive. 6. 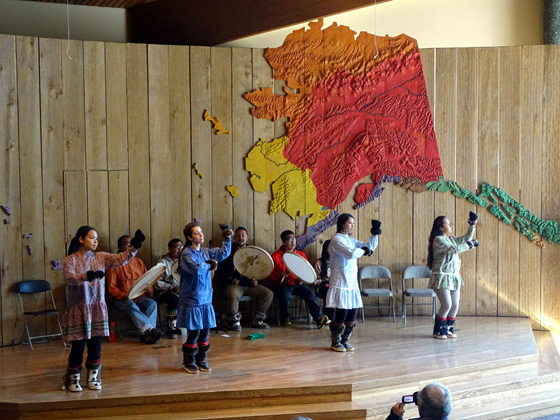 Eyak, Tlingit, Haida, Tsimshian peoples lived in the Copper River-southeast panhandle region, an area rich in natural resources. 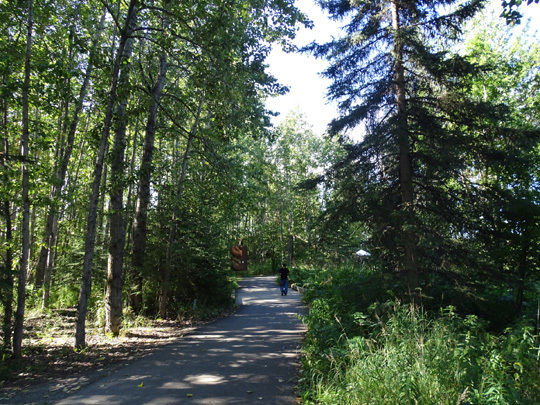 The temperate rainforest produces many tall trees; wood was their most important commodity. Food was plentiful -- fish, game, wild fruits, and vegetables. 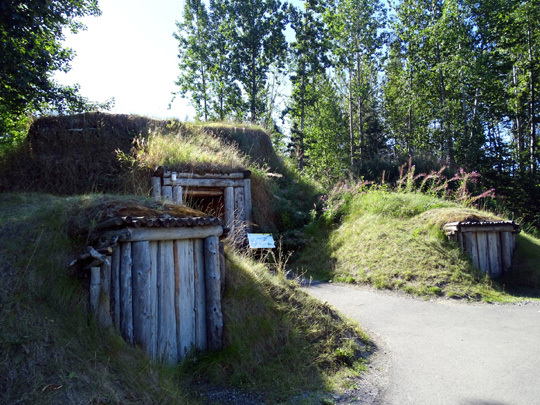 Similar to other Native Alaskan cultures, these groups lived between the forest and sea, with both summer and winter homes chosen for their easy access to resources and protection from storms and enemies. 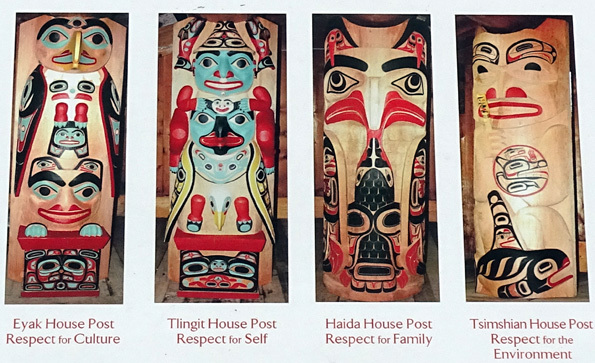 All of these six Native Alaskan cultures have many beliefs and customs in common but each also has some differences based on location and other factors. It was enlightening to read all the interpretive panels either on site or when I was editing my photos. Although their lives were difficult because of extreme weather and other factors, these various clan systems operated quite skillfully and efficiently. There were interpreters in some of the houses that were happy to answer any questions and offer information about their traditional ways of life. 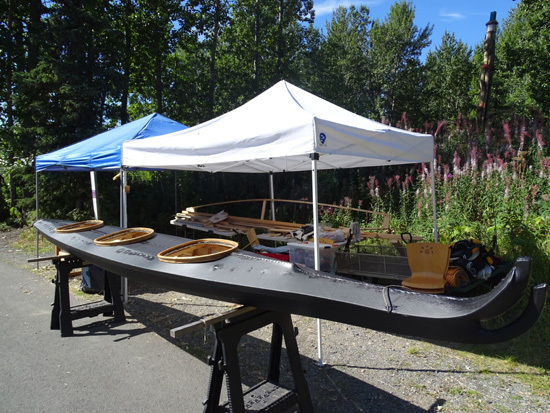 I didn't get to see any of the demonstrations of traditional hunting, fishing, building kayaks, or constructing dwellings; all the folks doing the demos must have been at lunch during the time I was out there (or perhaps they don't do as many demos on weekdays). 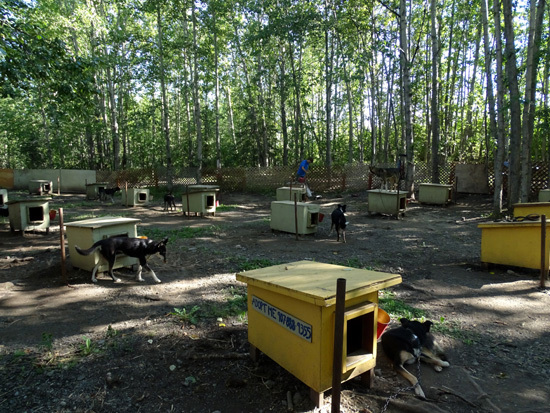 Rides and a presentation re: the history of sled dogs in Alaska are offered for $10/person. 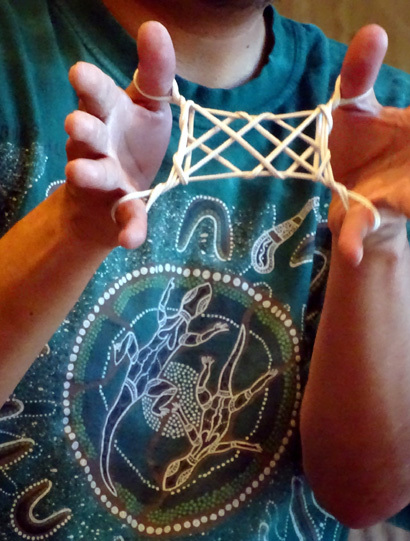 After eating lunch outside I went back inside for a fascinating demonstration of Native string art by a young man who learned the craft from his father and grandfather. The running commentary as he made each figure was very interesting. Those two purple things on the wall depict Aleutian Islands on the large 3-D map . . . I was sitting pretty far back in the auditorium and I never use a tripod. The narrator morphed from one figure to the next quite skillfully. It was fascinating to watch him and listen to his stories. 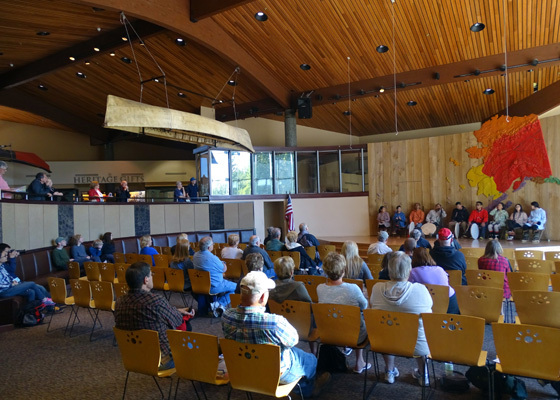 Just before I left I watched a second session of dancing and talk about Native culture. 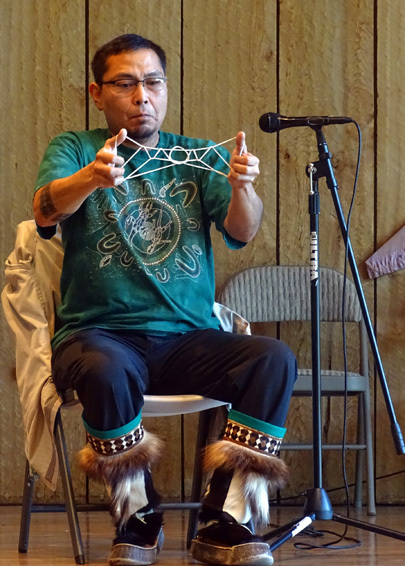 The speaker eloquently discussed why it is so important to the indigenous Alaskan groups to educate both their younger family members and the public about their cultural values and traditions. So much of their culture has been lost in the last 200 years. They relied on oral history until about 50 years ago. 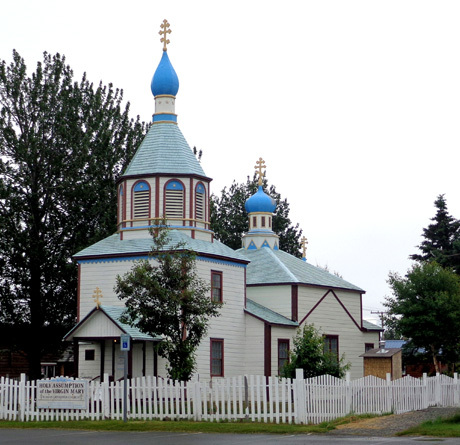 Various Christian missionaries (primarily American and Russian) tried to change the Native Alaskan cultures by forbidding dancing and other traditions. 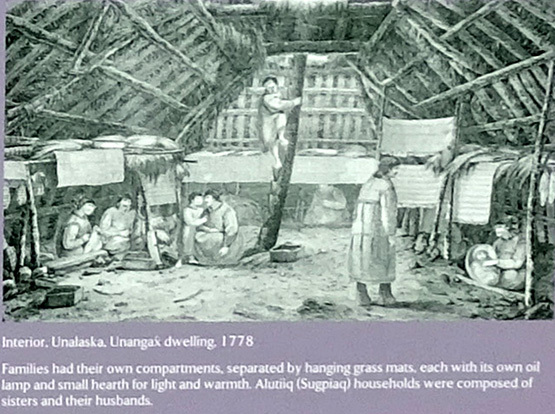 The people who lived in the Kodiak area were most direly affected, losing almost 100 years of their culture to outsiders. This angers me as much as the treatment the Native Americans in the Lower 48 have endured since white and Hispanic people decided that land should be theirs. I think it is despicable for any ethnic or religious group to try to force their will and beliefs on other people who are deemed to be "uncivilized" or "unsaved" or simply "in the way." Give it up. Don't be so presumptuous to think that everyone else should have the same beliefs you do. Each culture has its own beliefs and customs. Respect that. 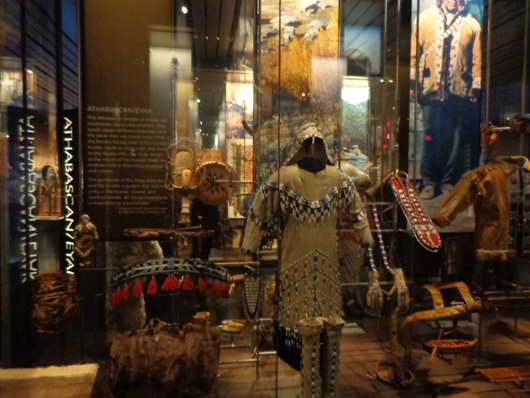 I highly recommend every visitor to Alaska experience this and other Native Alaskan museums, visitor centers, festivals, and other venues and events offered during the summer. 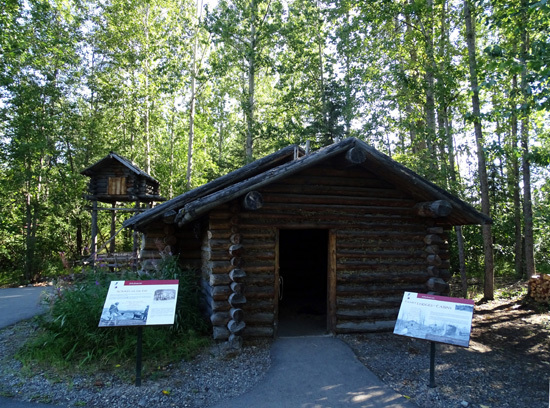 After all, one good reason for visiting Alaska in the first place is to learn about its history and culture. Despite my emphasis on scenery and critters on this website, even *I* realize it's not all about the scenery and wildlife.